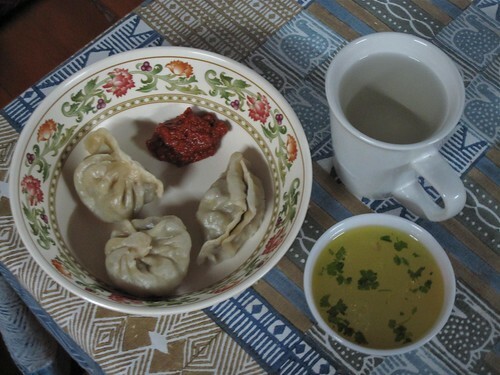 green tea: Bhutan to-do list: learn to make momos! Bhutan to-do list: learn to make momos! 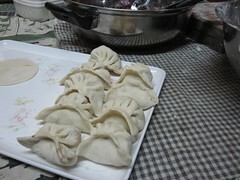 One of the items on my 'Bhutan to-do list' was to learn to make momos. I mentioned this ambition to Kuenga and she invited me to her family's home when they next made them. The special occasion was that the family had bought a leg of beef - momos are too labour-intensive to make at home regularly. 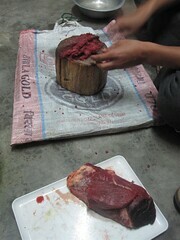 The first step was converting the chunks of beef into mince. This was done with a big chopping knife and a wooden chopping block. 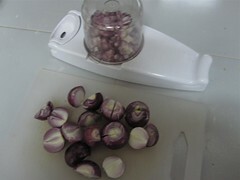 While the beef was being minced, I peeled and diced the red onions. The beef needs to be browned on the stovetop. Oil, salt and chili powder are added. Add onion and, if available, chopped coriander and/or spring onion. The momos will be more tender if the meat is only just browned through. The dough is made from one kilo of locally available flour - all purpose flour works, too. Water is added a little at a time until the correct texture of dough is obtained (soft but not overly sticky). 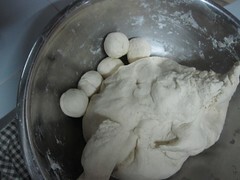 The dough is then rolled into little walnut-sized balls. Each ball of dough has to be rolled out in a circle. 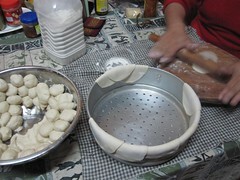 In this case, the flat dough circles were placed on the rim of an oiled steamer tray. Now, time to try stuffing the momos. But in the end, we focused on the crescent shape with varying results. We made around 100. 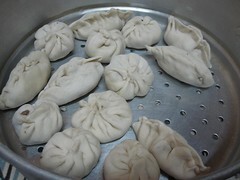 The momos are then steamed until the dough is just about transparent. 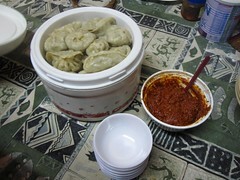 The hot momos are served with fresh homemade eezay (chili paste) and soup made from bones from the same leg of beef. Thanks Kuenga and family for inviting me and teaching me this new skill! Those look delicious! My bf's mom is Korean, living in the US. All her Korean lady friends get together to make massive quantities of laborious food together, then they share it all. Very cool.